The experts and licensed Calgary gas fitters at Lone Star Plumbing and heating can install outdoor gas lines for a number of different heating devices. Whether it is an outdoor patio heater or an outdoor gas fireplace our Calgary gas fitters have installed a gas line for it. Our experienced gas fitters will work with you to install gas lines that work with the vision you have for you backyard heating. We can provide fast and accurate quotes and can install all the gas lines you need in a quick and safe manner. We all know the outdoor season in Calgary is too short, but there is a way we can extend the time of year we spend enjoying our outdoor spaces. The advances in outdoor heating have made it possible to enjoy a drink on the patio in early May or a gathering around the outdoor fireplace in late September. The advantages of outdoor patio heaters and gas fireplaces makes it easy to enjoy our backyards longer in the year. The convenience of a gas patio heater enhances how we utilize our decks or patios. With a patio heater you don’t have to cut your outdoor gatherings short as soon as the sunset comes, one simple turn of a dial and you have the warmth that makes your outdoor space comfortable again. 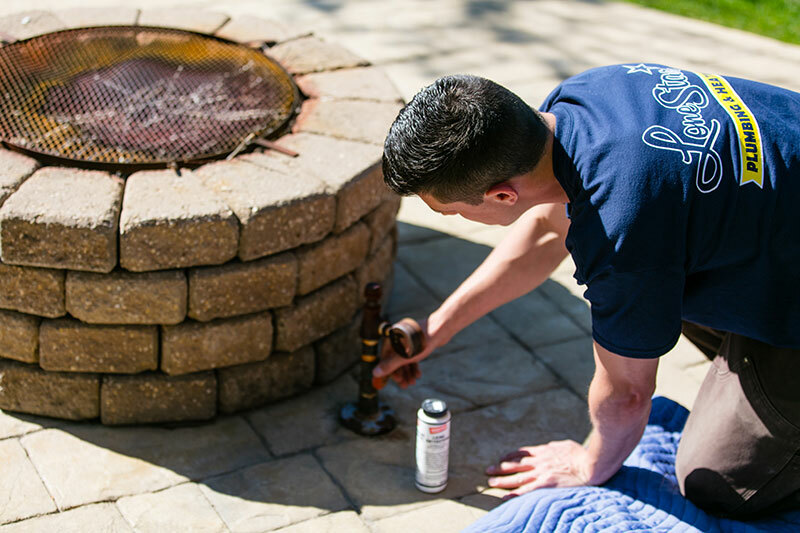 Installing a gas line for your patio heater is easy and affordable when you contact the Calgary gas fitters at Lone Star Plumbing and Heating. An outdoor wood burning fireplace is nice to gather around during summer nights, with the installation of a log lighter you can take out the hassle of having to cut kindling and find newspaper to start the fire. Instead you can turn on the gas valve and light the burner to start the fire. If you prefer an outdoor gas fireplace or fire table our Lone Star team will be able to install that for you as well, with the flick of a switch your fireplace will be lit and the ambiance of a smoke free fire will set the mood for the night. Spend less time getting an outdoor fire going and more time enjoying it with your friends and family. Let the Calgary gas fitters at Lone Star Plumbing and Heating install a gas line for your outdoor fire needs. We are ready to provide you with a quote and help you with any questions that you may have about outdoor gas line installation. For more information please call us at (403) 295-3028.